The beautiful ice princess wants to show off her powers, but she needs your help. She can't find her royal tiara, her stunning dress and her magic snowflake. 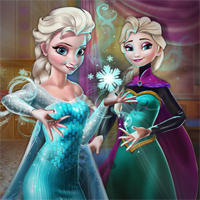 Join the princess in this lovely game and help her transform into a real ice queen! Start by finding the hidden objects in each level. There are snowflakes all around the castle and you should use your skills to locate them. After that, you will unlock some amazing puzzles! Solve them and the princess will get her lost items. Do your best and don't let her down because she is counting on you!